Delaware is the second smallest state of the United States by area and is ranked 45th by population. Wilmington is the largest city of the state by population. According to a 2016 estimate, Wilmington comprised a population of 71,442 inhabitants. The city, which was founded in 1638 and incorporated in 1731, covers a total area of 16.94 square miles. 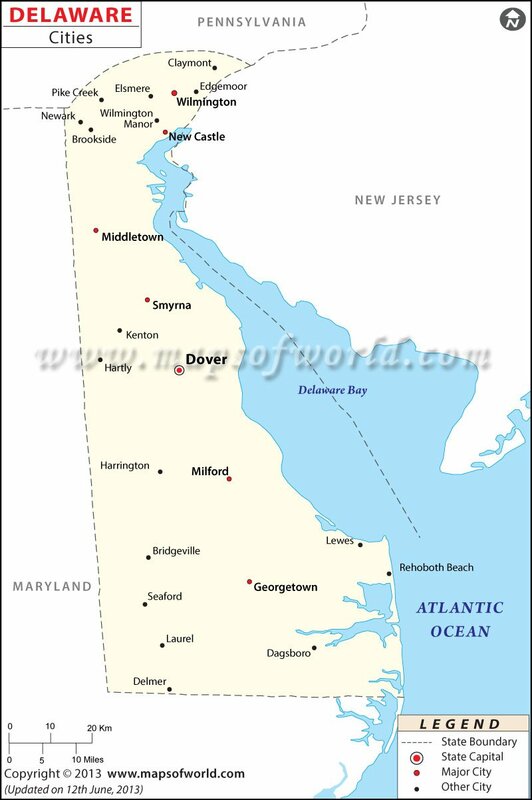 Dover, which is the capital of Delaware, is the second largest city by population and as of 2016 had a population of 37,786 people. Newark, which is home to the University of Delaware, is the third largest city and had a population of 33,398 inhabitants, as of 2016. Some of the other major cities are Middletown, Smyrna, Milford, Georgetown, New Castle etc. Meanwhile, Hartly, which is a town in Kent County, is the least populous comprising a population of just 71 people, according to a 2016 estimate. The state is divided into three counties. The state capital Dover is the second largest city. It houses Delaware State Library, Delaware State Museum, and Delaware State Archives. Wilmington, built on the site of Fort Christina, is the largest city in Delaware. It was the first Swedish settlement in North America. Newark, in northern Delaware, is the home of the University of Delaware. Middletown, Smyrna, Milford, Seaford, and Georgetown are otehr major cities in the state. The Wilmington Airport (ILG) is the busiest airport in Delaware. Amtrak stattions in Newark and Wilmington are served by trains along the Northeast Corridor. Interstate highway I-95 and six U.S. highways form a dense road network.